Henry is the owner of Hawk's Floor Covering down on 10th street and for the past 25 years he has been covering more than floors with indoor/outdoor carpet. Conveniently, he had a picture album of his exemplar projects. Cars, trucks, garage doors, gutters, exterior walls, even house footers... it seems that any flat surface can be covered with indoor/outdoor carpet. Henry has even used the carpet to aid in landscaping. Think about it; weeds can't grow up through it. He said that cars are his most popular non-floor object to cover. If someone described his van to me, I would quickly jump to a single conclusion: this guys is nuts. Actually standing in front of it, I have to admit that it looks kinda neat. The covering is very uniform, giving the surface a trim look. 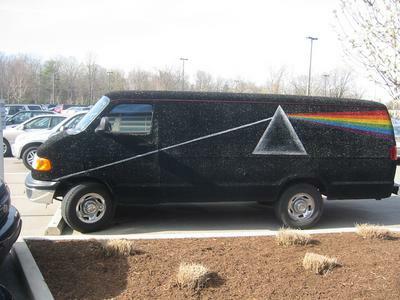 The lines of the van are still pronounced although there is a quarter of an inch of carpet on it. Henry said that great candidates for this treatment are cars that may run fine but have bodies that are failing. The carpet very effectively covers rust and small dents (maybe cover up that hail damage you have?). Thank you for posting this!!! I was a floorcovering sub-contractor in another life, and this van was always at southland flooring supplies whenever we drove by to pick up some glue or what-not. I was always curious about the who/what/why/wft of it all. This van used to be parked at a house at 10th and Mitthoefer on the east side, where they used to have an entire GARAGE covered in "fuzzy." I found this to be an very untresting eaticle. Magic carpet ride takes new look after11 years.